Add these accents to make your kitchen full of style and substance. A blend of contemporary and vintage-looking functional accessories in the kitchen makes it a space that is a comfortable yet chic. Technically spring begins on March 22, but the weather in South Louisiana permits us to start on spring cleaning – and spring socializing – a little earlier. As you may be preparing to host dinner parties, warm-weather celebrations or festival gatherings, there are little things you can do to get organized and make your life a little less chaotic as a host or hostess. One way to do that is to look into some affordable and accessible storage solutions that’ll brighten up your kitchen and also make it less cluttered. We found some stylish items that are both functional and fashionable, so that when you’re searching for that important ingredient or utensil, it’ll be right in front of you. 1. These colorful farm- themed cannisters that come in a set of three are perfect for storing dry products such as noodles, rice or sugar. 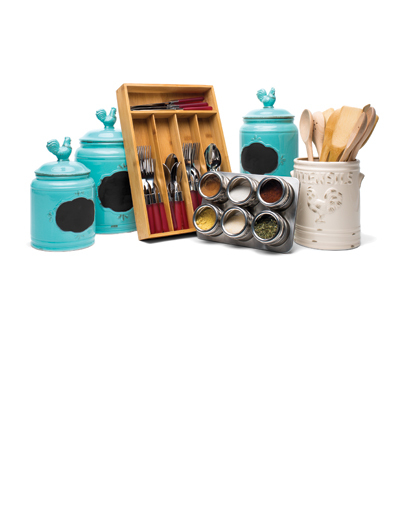 Their chalkboard labels provide an easy, low-maintenance way to keep track of the goodies waiting inside each container. Kirkland’s, 3001 Louisiana Ave., #100, Lafayette, (337) 233-4134. 2. With four spacious compartments, this bamboo silverware tray is a stylish and affordable storage solution to keep your utensils organized. Seville Bamboo Organizer Tray from Target. 3225 Louisiana Ave., Lafayette, (337) 769-7515. 3. Store your favorite spices in this cool, contemporary spice rack made of stainless steel. It’s magnetized, so spices can be stored at an angle that allows for easy access. Mastrad (set of six) Spice Jars with Stand. E’s Kitchen, 1921 Kaliste Saloom Road, Suite 121, Lafayette, (337) 534-8928. 4. This vintage-inspired utensil holder, in a lightly distressed ivory color, helps keep clutter off your counter and is dishwasher-safe. Ivory Vintage Rooster Utensil Holder. From Kirkland’s.